A Lengthy and Heartfelt Post, for Those with Time! In pre-Internet days, I would have found out news about my hometown and high school friends through visiting my parents, running into their friends (the parents of my friends) or occasionally seeing them at community events or other public places when I was in town. My brother and sister would tell me who they had seen and what they knew. That is the traditional way – everyone was tied to a place. You would be drawn back, or never have left. It was a good feeling to go “where everybody knows your name,” but of course, there was also gossip, and grudges, and old reputations that could never be changed. A box of letters from my sister to comfort me in my old age! 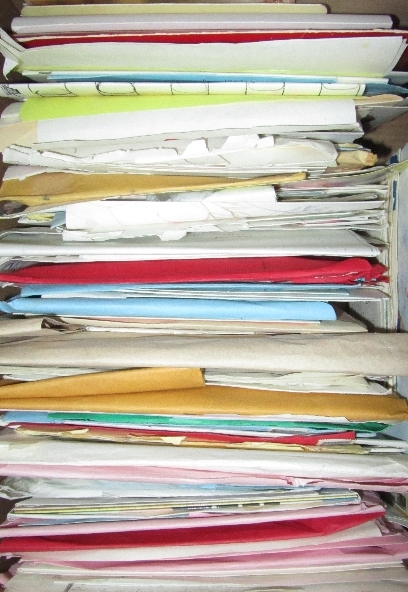 After I left home, I spent 10 to 12 years writing regular personal letters, mailing them, awaiting a reply, and writing again – a cycle that took about 3 weeks. The anticipation of a letter, and the opening and reading of it, is a feeling that can’t be matched. It was so tangible! Each correspondent’s handwriting and doodles and printed photographs revealed so much about them. My early emails were really letters that were typed and sent. It was a long, long time before emails devolved into short, business-like bits of information. I suppose that started with the advent of texting. I have turned into one of those laughable decrepit people who texts their own kid in this format: “Hi Link…Love, Mom.” Despite being advised this is “not done,” I guess I crave the formality of referring to each other by name. And to distinguish myself from the hundred other texters who don’t. Maybe that is vanity. I’m your mother – acknowledge me, dammit! So, Facebook. I was a reluctant joiner. I hesitated to put my full, real name out there. What if people I barely remembered or barely liked asked to friend me? I didn’t want to broadcast my life to people I wasn’t close to, but I didn’t want to hurt people’s feelings by snubbing friend requests either. On the flip side, it was satisfying to announce big changes and get instant replies from real people. Ultimately, I’ve never been able to balance that trade-off. It’s partly a generational thing. Anyone born after 1990 grew up with the Internet and with having a public persona. For me, that came much more slowly, through anonymous blogging, first on MOG and later here on WordPress. I’ve always been a private person in real life, and blogging at length about a topic suits me better than trumpeting my joys and sorrows to an average of 338 greater or lesser friends. I have 6 Facebook friends I’ve never met in person, but feel safe with! You might think a good strategy would be to de-friend the people I haven’t seen in decades. But quite the opposite appeals to me. I have deep friends-in-the-heart whom I never get to see, but I still treasure them. And I have acquaintances I see every week that I have no need of keeping up with! I have chat turned off (as if I would want to talk to actual people!) and I never get any messages. I had a big shake-up this Fall when I realized that my love-hate relationship with Facebook just wasn’t working. First of all, I have a former colleague I hold in very high esteem, who is a Facebook friend, and whom I haven’t seen in several years. We read each other’s blogs and I feel we are quite simpatico. This person contacted me at least twice when they were in town, wanting to meet up, and I missed out both times – because it was through Facebook messages – which I never even remotely thought to check. Talk about “kick yourself” moments! I do know there is notification for Facebook messages but I had received some pesky, ignorable messages in the past, so I thought it would be more of the same! But then the real kicker. I was speaking with my sister a couple of weeks ago and she told me about the sudden death of a person who had been a teacher and mentor to both of us. My sister thought I already knew. Neither of us had seen her for many years, but we enjoyed reading about her talents and influence on Facebook. I was surprised and upset, and I thought I could at least express my condolences online. So I proceeded to her Facebook page, only to find out she had died more than two months ago. I was mortified. It’s bad enough that I often miss the birthdays of my Facebook friends. But to not even notice when they die? My #1 goal for 2015 is to actively stay in touch with people who matter to me. And if the people in my life use Facebook, then Facebook will be one of my methods. It is time for me to use it as the tool it really is. And for those who are not on Facebook – or who don’t love it – I am pledging to make personal phone calls and write personal emails and even post a handwritten letter now and again. I have reviewed how to categorize my friends and to limit status updates to certain categories, such as “family” or “close friends” (kind of like Google+ Circles). On a personal note, I have been living a bit of a double life for the past 5 years because my kid Link has not been “out” to everyone as a genderqueer and transgender person. But now they are! And that gives me the opportunity to be my true self more, online and off. That makes me “out,” too. I have a Facebook page for An Exacting Life which I use only for pushing out notifications of new posts. My loyal and few Facebook followers can expect actual updates there, too! I am dreading the inevitable – that I have to actively get on Facebook. I have avoided it because it can be so superficial and “false front” but it means I miss out on a lot (including what is going on with people I know through queer activism and from my job – two groups with no Venn overlap). I can log in and visit some pages, but I hate that whole “friend” concept. I was hoping that the next big thing would come around and I could join it instead, but it doesn’t look like that is happening anytime soon. I guess I prefer anti-social media. I am in the same boat, Jamie! I have to use it for its advantages, rather than rejecting it for its disadvantages. Yep, definitely opposites – we should meet in the middle! I have a real love-hate relationship with FB. I go through regular cycles of wanting to shut it down but so much of general life is organised through FB that I’ve resigned myself to staying on it. I’m amazed that you have the self-discipline to check it so rarely! I check it at least once a day, usually several times a day (scrolling through on my phone.) But then I feel annoyed that my life is so dependent on an app. Just this week: our extended family Christmas gathering was entirely organised on FB (who was bringing what food, directions etc. ); a friend of my sister’s died (the one who had the stroke) and the funeral is being coordinated via FB. Even more frightening, the stroke patient had repeatedly posted her medical intentions on FB (a ‘no resuscitation’ theme) and FB thus became a critical factor in decisions during the final weeks of her life. Hi Fiona, I am very sorry to hear that your sister’s friend died. And know you will feel good for having visited. I have organized lots of things via email but not FB, so that would be new to me. Would be afraid to post medical information for sure, but maybe it’s not a bad idea when you actually do want everyone to know. 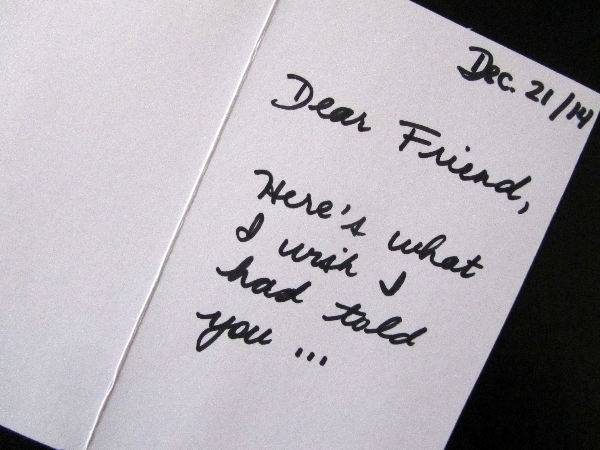 I remember the days of pen pals (did you ever do one of those pen pal groups?). I used to love writing and waiting. For some reason we got computers fairly late in life (never owned one before I was 23). However, we fell in love. We love social media, the instant communication, even just one line texts. However, the one thing about Facebook (and other media sites that aren’t blogs) is sometimes you learn something about people that you hadn’t realized (Facebook was a quick way for me to find out what friends/family where homophobic when husband transitioned, racism, etc). I guess that is a good thing in the end but that was a disturbing trend. Also, never understood the whole contest on how many friends you have on Facebook. I think right now I have 78 and that is fine (unless I meet new people, I always like befriending new people). Oh yes, I loved having pen pals! I have had the same experiences re: finding out people’s true natures on social media. Fortunately, sometimes in the same direction as me rather than against: for example, finding more people than I expected who are supportive of LGBTQ rights, rather than fewer. I do have to agree, Facebook was way more accepting of the hubby’s transition then expected (oh and sorry that I am answering from both my accounts, now I am too lazy to go back in and re-log in). I wonder what a better alternative would be. Seems like none have caught on yet. If it weren’t for FB, there would be a lot of people who would be essentially “lost” to me, so I do appreciate it. That’s why I’m on Facebook too – because some people will not stay in touch any other way! It’s really nice to read a post about the positives of Facebook, which vows to use it more! I have 140 friends on Facebook, about 36 of whom I have not seen in real life the past year. Two of those are relatives in America who I have never met, but other than that I keep my Facebook friends to people I know in real life. I have a running group that I would never have joined without Facebook, and which organises all of its runs through Facebook, and Facebook means that I keep in touch with people whom I otherwise would not. I meant to add that my only issue is (as has already been said above) the temptation to check Facebook on the app repeatedly is strong…I might decide that my aim for 2015 is to restrict my Facebook (and all internet) checking to 2-3 times per day. I need to learn to resist the urge! You can give some of it to me? I get updates from a few groups and although they don’t arrange a lot of events, it is a good way to keep up with what’s going on. And of course I am always up for cat pix!! This is the first social media related goal I’ve heard where someone wants to engage in Facebook more not less! Facebook always had good intentions, which you’ve pointed out. I’m curious to see how you feel in six months after keep up with this schedule. If you’ll feel like you need a break. Being off FB completely has been better for me because I still get told information, since everyone knows I won’t see it on FB. So in the case of a death or other important news, I still get directly told about it. It seems like FB is an all-or-nothing proposition, then! I will have to report back on how I’m doing. I suspect I will forget it regularly, and have to nudge myself. I have Facebook, and was an early (Australian) adoptee as I was living overseas with Americans in 2006. I just checked, I have 474 (!) friends! I remember my brother racing an ex girlfriend to 300 years ago. How silly – that brother now doesn’t use it. Seeing I moved away from the city I went to school in, I have my whole year cohort plus some. I don’t have the idea others do of ‘only having people you want to know about’ – I’ll never ‘run into’ these people, so if they post to Facebook, I have a better chance keeping up with their life. Then I have people I’ve met the times I’ve lived overseas (two three week residential programs beefed up my numbers in the ballpark of 60!). Then there’s people through life you meet etc. Interestingly, I have developed some stronger relationships through facebook, with people whom I’d otherwise be less close to. Also, I have close friends who are on facebook, but never post, and meeting them can be awkward, as they seem to know everything about me, and I know nothing. That can annoy me – it really unlevels the playing field! Your numbers make sense based on your experience! I’ve also had the nice experience of being friended by those I don’t know super-well (maybe through work) and being charmed by how thoughtful they are online. Impressive! Do you have a Tumblr? haha, the comment from The Asian Pear made me laugh 🙂 I’m not on Facebook either and won’t be joining. Everyone knows I’m not on there so they will usually go out of their way to make sure to share big news with me (probably annoying for them, but I appreciate it). Little, everyday happenings I don’t find out about – and I’m okay with that! I am not opposed to social media so I think it would be hypocritical if I refused! But now to actually use it! Merry Christmas, Dar! I probably should send wishes via Facebook to stay on theme, but either way, hope you have a great day. And I hope you *don’t* end up with the predicted 50mm rain – it took a few hours for me to realise just how much that would be in one day (it’s several months worth of rain here.) Have a lovely day! Tonight is foggy and warm and all that rain is still expected! Well this post addresses my comment on your earlier post about goals! Contact with friends is clearly going to be a goal. I’m a frequent FB user – waste much time on my iPad flicking between a forum I am on and FB – reading and re-reading the same things. But I have very few friends – my job made me a late user of FB and I do restrict my friends. I too miss the joy of the letter. I had pen pals and wrote cards and letters regularly to family. I think FB and other constant messaging and social media sites actually make homesickness worse for travellers (of the long backpacking trip kind of traveller, not the short holiday kind) as they are still constantly enmeshed in their home world. I am in the same boat; very few close friends – not so much a choice, but a side effect of moving many times in my adult life, and everybody but family being super-busy. So I really do want to show my near-and-far friends that I value them, no matter how busy we are or how rarely we see each other. I like your comment about not being able to get away from one’s home world – in the past, we simply didn’t know what anyone was doing until we got a call or letter – I never thought of that as being an advantage! I have subscribed to the same passive-agressive FB strategy, with similar results. And I too have been rethinking this and planning to be a more active user. I don’t have many “decades ago” friends, though I have a few. I have friend requests from people I’ve kept hanging and I need to figure out how to handle them. I wish there was an “Ignore For Now Until I Figure Out What to Do” button. I have done the same thing, occasionally leaving people hanging. I think Facebook has changed its terminology so rather than clicking NO, it says “not now,” letting them down a little easier! Realistically there are two solutions: either say “not now,” or accept them and categorize them as “limited” or some other category you make up. Then when you do updates, you can choose which groups of friends to send them to. Let me know how your new strategy goes! I have to admit, I’m not the best face book user and I don’t check it every day. Sometimes it feels exhausting to keep up with all the social media. I often get in trouble for not checking my mobile phone…..
Me too but I am doing better now!